Functional wares in stoneware and porcelain! Potter Kyong-Hee Kim invites you to her studio. Her inspiration comes from traditional ceramics and nature. After settling on Tamborine Mountain, she built a studio using an earth bag building method. 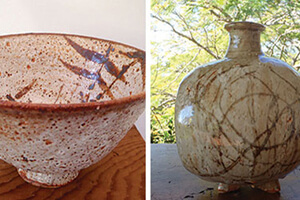 Her work features simple and traditional glazes and natural oxides. Recently she has been creating glazes with ash from Australian hardwood and working with the sculptural form of ikebana vases. This entry was posted in Art Studios and Galleries and tagged Artist Studios, Kyong Pottery, Studios on Tamborine, Tamborine national park on March 4, 2017 by Detlef.